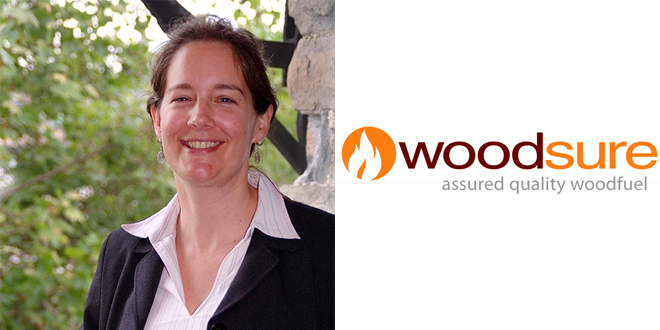 Helen Bentley Fox, Director of Woodsure – the UK’s only wood fuel quality assurance scheme – answers some of the top questions affecting the wood-burning industry today. A: Woodsure is the UK’s only woodfuel quality assurance scheme which ensures its suppliers are certified for reliable, high-quality products. The Woodsure stamp of approval means that a supplier of wood fuel has been through rigorous checks and testing to ensure their fuel meets the correct standards. Since the scheme was introduced, consumers now have the opportunity to choose from a growing network of trusted suppliers and consequently, we’ve seen an improvement in fuel quality levels. It has boosted industry confidence, reduced boiler damage but most importantly, it’s helping to protect UK air quality from pollutants caused by poor quality fuel. Q: What are the benefits of using Woodsure approved fuel? A: The Woodsure certification scheme and its logo gives those burning woodfuel a brand they can trust. Customers purchasing woodfuel from a Woodsure certified producer can be assured the woodfuel will provide optimum efficiency and will come from a sustainable source. For installers, using Woodsure approved woodfuel ensures a smooth-running and reliable installation which will enhance the installer’s commercial reputation. The hard work and commitment of a professionally delivered installation can be jeopardised by poor or variable fuel quality. We recommend that professionals minimize this risk by relying upon the assurances that are inherent in the Woodsure quality mark. Q: What are the main objectives behind the Woodsure quality assurance scheme? A: To improve the standards of woodfuel and increase the understanding that you can’t just burn any old timber. There has been a loss of understanding in this country about how to burn wood correctly. In France, where there is a tradition of using solid fuel woodburning stoves and boilers to heat the home and the water supply, it is second nature and the skills have been passed on through the families. It is something we’ve moved away from in this country when we moved to coal and joined the ‘dash for gas’. It would be great to see Britain return to using home grown fuel. As a country we have just 13% woodland cover – the lowest levels in Europe – and 42% of our woodlands sit unmanaged and neglected. Bringing these neglected woodlands back into management would allow them to be a perfect source to supply the UK woodfuel market – a goal that Woodsure is supporting by working in partnership with Grown in Britain. A healthy, quality woodfuel market holds the key to getting our woodlands back into management. Q: What are the risks associated with burning poor quality or inappropriate wood fuel? A: It’s no secret that a woodstove or biomass boiler is only as good as the wood you burn in it. Waste wood or ineffectively processed wood fuel simply doesn’t offer a carbon neutral energy source. By making responsible choices about fuel quality and the woodland it’s sourced from, we can all play our part in securing its future and reducing carbon emissions. The most common issues arise from the origin of the wood, which can be compromised by incorrect moisture content, high ash content and even soil or stones, or the presence of chemical contaminants with waste wood. Inappropriate storage of the fuel during production or trading, can also affect the quality of the product, through contamination and exposure to impurities. Poor quality, or inappropriate fuel affects the efficiency of your boiler or wood burning appliance. The correct quality wood fuel will also maintain efficiency and minimise the release of emissions through products of combustion. Q: Do I save money using Woodsure approved fuel? A: Appropriate woodfuel not only provides optimum efficiency, it also benefits homeowners’ appliances, reducing the chance of damaging your appliance: therefore saving money in the long term. European and International woodfuel standards for all renewable energy heating appliances and the supplier can ensure you get the right fuel for your appliance. Q: How do I know if my fuel is Woodsure approved? How do I find my local Woodsure approved fuel supplier? Today the Woodsure scheme is now a recognised standard within the UK’s woodfuel market and for installers it identifies the conscientious, responsible suppliers who produce a trusted product. There are approximately 800 woodfuel suppliers and producers in the UK. Woodsure certifies nearly 200 depots, and the list is growing.